I love all the pattern papers we carry. But I also enjoy classy elegant cards. Whimsical is OK. But black, red and white or anything with BLING is more my look. 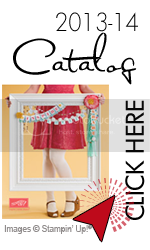 Stampin'Up has awesome brushed gold and silver card stock. They also have a shimmering white card stock that is beautiful when complimented with gold or silver. The above cards use the shimmering white card stock that I have embossed. I wish the photo showed how beautiful all three cards are. 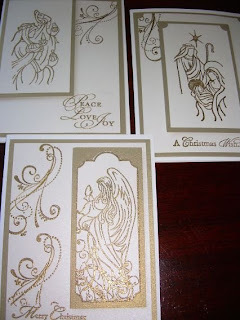 The stamp set I used is the Holy Triptych the perfect stamp set to use with the gold and shimmering white.